A hydro generator is essentially a machine that allows you to generate electricity though hydro or water power. It is in fact fairly easy to build a small hydro generator, and you will feel proud of being able to generate your own power source from nature. This is quite a popular method with some households, similar with the use of convertible solar energy. Some of the materials you’ll need for this DIY project include garden pipe, motor generator, water wheel, wire coils and light-emitting-diode (LED). This project applies a similar system that is used by larger hydro generators that transmit electricity supply to homes and commercial buildings. Using the materials, here are the steps on how to build a hydro generator. (1) Water source is the main priority- it should be taken from a nearby reservoir or river. You need to determine the hydroelectric potential of the source before you construct anything else. Basically, the flow or movement of water creates electric power. That explains why waterfalls or strong, gushing rivers are good sources. Blades are rotated due to running of water. (2) Rotating wheel is then connected to AC generator. This helps to spin the rotor. Inside the wire coils, the rotor is attached to powerful magnets. The spinning of magnets cause electricity to flow in the wires set up earlier on. This literally shows that rapid movement of water is converted into electrical energy. The source of energy can be used for different purposes. Soon enough, you will need to pay less for electricity and be able to enjoy this newfound electric source. (3) To test the efficiency level of the generator, LED is used. It will light up when electricity is generated. These mini generators are useful for smaller environments. Water dams are built for the very same purpose, to convert water energy to electrical energy. Cost of operating such a generator is much cheaper than using non-renewable sources such as coal or fuel (gas). Another advantage is that the supply of electricity can be transmitted to faraway places with the use of sophisticated wiring system. 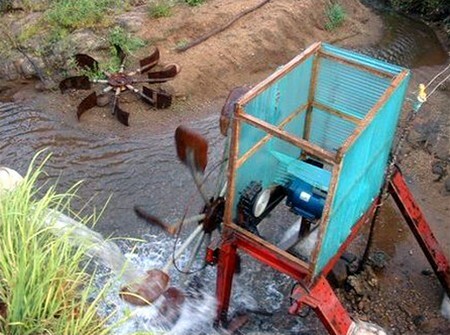 Listed here are some common steps on how to build a hydro generator. There are also other ways to build such a device, some using easy-to-find household products. Many science projects also employ a similar building method for their students, though it is less complex in nature. It is a good exposure because students can now build their own electricity generator.